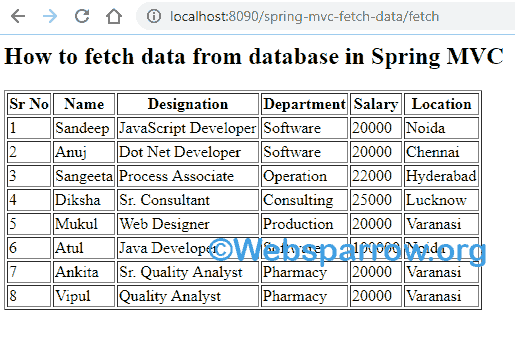 In this tutorial, you will learn how to fetch data from database in Spring MVC. Spring framework provides a class JdbcTemplate inside org.springframework.jdbc.core package under the JDBC module. And by calling its query(String sql, RowMapper<T> rowMapper) method it will return the list (in my case, it will return the Employee type list). You need to pass your SQL statement and object of RowMapper class. To fetch data from database in Spring MVC application, you must follow these steps. 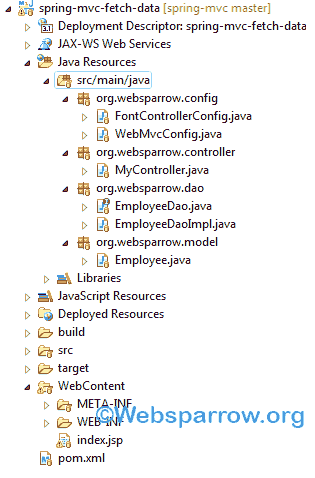 Register your front controller and enable Spring MVC feature. Register your database credentials like URL, username, and password. Execute the SQL statement and store in a list. Iterate the list on JSP. Find the list of all technologies used in this application. To retrieve data from database in Spring MVC application, you need the following JARs. Create an Employee model class and mention its attribute like name, salary, department, etc. Create EmployeeDao interface and define the empList() method of Employee type. Create an implementation class EmployeeDaoImpl that implements EmployeeDao. The getDataSource() method returns a configured DataSource bean. You may have to change the database URL, username and password according to your environments. And getEmployeeDao() method returns an implementation of the EmploueeDao interface, which is the EmployeeDaoImpl class. This bean will be injected to the controller class. Create a controller class that handles the user request and @Autowired annotation inject an instance of the EmployeeDao implementation into this controller automatically. On the JSP, iterate the list returned by controller class using JSTL. Run your application and hit the below URL in your browser address bar.